October 26, 2012—November 14, 2012: An email to Clinton from her computer technician raises the question of if he sent her other emails. July 23, 2014: Clinton’s lawyers are sent some of Clinton’s emails so they can begin sorting them. July 2014 is the same month the State Department first informally requests Clinton’s emails. Mills and Samuelson will be two of three Clinton associates who sort through which emails to turn over and which to delete, along with Clinton’s personal lawyer David Kendall. In late September 2014, PRN will send the rest of Clinton’s known emails to Mills and Samuelson. Late July 2014—December 5, 2014: The Clinton lawyer who sorts Clinton’s emails appears to have no security clearance and no special skills to do so. Between late July 2014 and December 5, 2014, Clinton lawyer Heather Samuelson spends “several months” sorting Clinton’s emails into work-related and personal, according to an account she will later give to the FBI. Samuelon allegedly does the vast majority of the sorting by herself. Clinton will later claim that she had no direct involvement in determining which emails to keep or delete and left that process to her lawyers. Her personal lawyer David Kendall, her lawyer and former chief of staff Cheryl Mills allegedly only assist Samuelson when there is an email she is uncertain about. In the FBI’s final report on their Clinton email investigation, released on September 2016, there will be no mention of Samuelson having any kind of security clearance when she sorts the emails. However, the report will mention when other people who handled Clinton’s emails did have security clearances, such as Bill Clinton aide Oscar Flores. 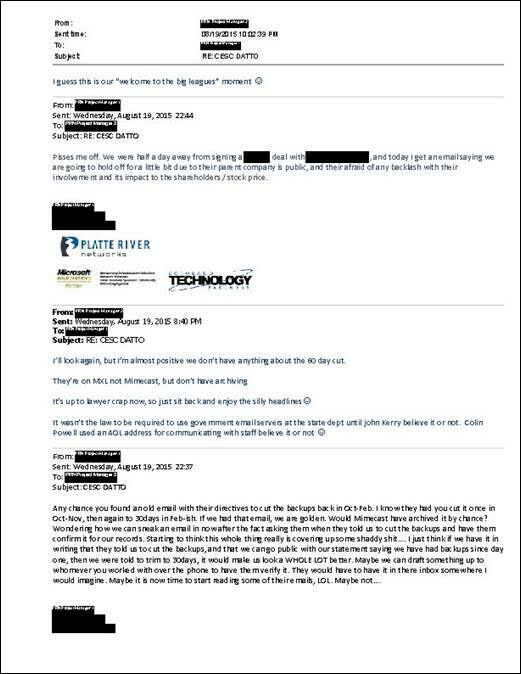 Shortly After October 28, 2014: A computer file from Platte River has a key role in how Clinton’s emails are sorted, according to testimony by Cheryl Mills. Mills is asked if she or Kendall were in physical possession of the server at the time. Mills further explains that she and Kendall “oversaw the process. The person who actually undertook it is a woman who worked for me.” This woman is another lawyer, Heather Samuelson, who Mills admits doesn’t have any specialized training or skills with the Federal Records Act or identifying official records. Then Mills is asked what happened to the “universe of the .pst file” after the work-emails had been sorted out. December 5, 2014: 50,000 pages of printed emails from Clinton’s personal account are delivered to the State Department by Clinton’s staff. March 4, 2015: The New York Times calls Clinton’s exclusive use of a personal email account a “disturbing departure” from normal practice. March 27, 2015: It is unclear if Clinton still has copies of her deleted emails. August 14, 2015: Clinton jokes about her emails at a campaign event. August 18, 2015: Clinton claims not to know what wiping computer data is. “Wiping” means repeatedly overwriting data with other data to make sure it can never be recovered.